Anyone that has lived on a rural property knows that nothing is more important than the fencing. Considering there are plenty of properties in the Werribee area that more than qualify as being rural, there’s every chance you either live, or will live on, a property that needs a certain type of fencing. Naturally, you can’t surround your property with aluminium slat, or even Colorbond fencing because the costs will add up very quickly. So, here are the best options for making your property secure and defined, without breaking the budget. Wood has always been the go-to option for fencing on rural properties. In the good old days, the land was cleared, and the lumber was quickly fashioned into fencing to demarcate your area, or keep your livestock in. Wooden fences are still popular, but you’ll probably have to settle for softwoods if you want to fence off a significant amount of property with it – can you imagine the cost of using hardwood? This is still a great option, but it does require upkeep to prevent rot and other issues. A wooden fence is also more suited to smaller properties, rather than fencing off properties of multiple acres. The ultimate aesthetic for rural properties is classic post and rail fencing. Think white painted wood, lush grass and horses wandering elegantly around paddocks. Well, even during the summer when the grass is brown, or if you have pigs, cows or alpacas instead of horses, you can still create a beautiful rural setting with this type of fencing. It also works as a cost-cutting measure, because you only need enough wood for the post, and the rails, if you want to make even more savings, use wooden posts and wire railings. If you’ve got some big and strong animals that like wandering off, you can’t go passed barbed wire fencing. It’s cheap, it’s efficient, and it’s been the rural property owners’ best friend for years. It’s also incredibly fast to install because all you need is some wooden or metal stakes, and the barbed wire that is strung between them. Because it’s made out of metal, there’s hardly any maintenance, just watch out for rot if you’re using wooden posts and the wire will last for decades. If you’ve got a hobby farm, with cute little critters like alpacas, deer, rabbits or even ferrets, welded mesh fencing should be at the top of your shopping list. Again, it made of metal, so it’s cheap, durable, long-lasting, low-maintenance and incredibly quick to set up. 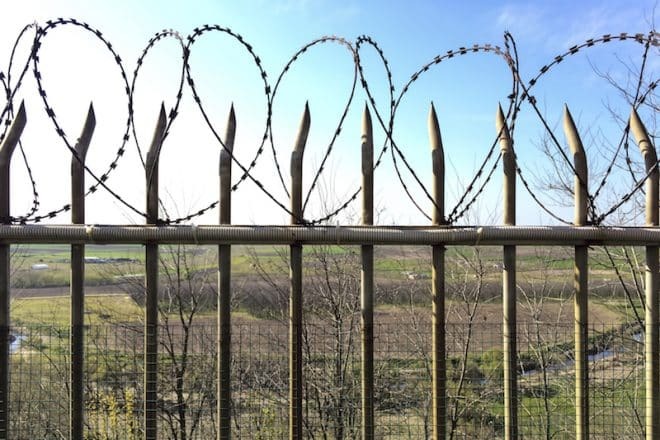 The main difference between it and barbed wire is that it’s great for animals that can burrow and jump, and it won’t hurt them if they run into it. This type of fencing offers all the benefits of welded mesh, with a soft, classic aesthetic. Think footage from the 50’s, sepia-toned photographs and your Grandma sitting on the porch of a fibro shack. It’s effortlessly rural, yet entirely modern. This will work equally as well around a property, or for your property’s frontage. Wrought Iron Fencing: Classic, timeless, elegant and undeniably Australian. You can customise the design as much as you like, and you’ll end up with a fence that genuinely suits your property and your personality. Picket Fences: Who doesn’t love a picket fence, and who hasn’t dreamt of a rural property fenced off with pickets. It may be a little folksy for some tastes, but you can be sure of one thing – your fence will never go out of fashion. And, with a lick of paint, you can reimagine it year after year after year. Aluminium Art Décor Fencing: For a real statement piece, you need this type of fencing. Glamourous, modern, stylish and completely customisable. This mode will suit everything from a classic property to a lavish modern homestead. This is just a sample of the types of fencing you could choose for your rural property. If you want the perfect option for your needs, budget and taste, get in touch with the fencing experts at Everlast Services. Get a free, no obligation quote and get your fencing project off on the right foot.